Vienna is the beautiful capital city of Austria, with opulent buildings dominated by Baroque architecture and an incredible history. Known for the Hapsberg Dynasty, the 19th century intellectual café culture, composers such as Mozart, Beethoven and Strauss, it was the assassination of Austria’s ruler that started the First World War and sent Europe into decades of conflict. In 2018, Vienna was voted as the best city to live in for the ninth year running for providing a first-rate quality of life and its commitment to the cultural wellbeing of its inhabitants. This makes it the perfect place to take a family for a cultural city break and so last Spring, Sarah took three generations of her family for a week’s holiday in the city of elegance, music and history. Vienna has a long tradition of music development, and a great destination to get children interested in music. I had always fancied a trip to Vienna, a city with a magnificent history and with so much on offer for culture vultures. When my children were finally old enough to be out of their push chairs and no longer in need of frequent rests, snacks and naps, it seemed like an ideal time to go. All of my research had shown that Vienna had more than enough to keep us all happy – in fact there was so much on offer that narrowing it down was the hard part. Here is where we finally chose to go and my helpful tips for each one. We stayed in the Inner Stadt or old town, the true heart of Vienna, in a spacious 19th century apartment with high ceilings, and huge windows which I had found on booking.com. On a quiet street, it was just a 5 minute walk to the cathedral, the crowds and the museums. This really was the perfect location as we were close to nearly everything we wanted to see, as well as close enough to just walk back to the apartment when feet did get tired and rests were needed. I would highly recommend doing the same, as we were able to spend our time right in the centre of things rather than travelling around the city. Vienna started life as a Celtic settlement before becoming a Roman military camp during the 1st century AD. An important 11th century trading site, it was the capital of the Babenberg dynasty (976-1278) before its most famous incarnation as the home of the Austrian Hapsberg Dynasty (1273-1918), the most distinguished of European royal houses. Vienna was besieged unsuccessfully by the Turks in 1529 and again 1683, and it was the subsequent reconstruction which turned Vienna into a baroque city. There were massive plague epidemics in 1679 and 1713 that killed thousands. Taken by Napoleon in 1805 and 1809, it was after his defeat that the map of Europe was again redrawn. After much expansion and the rerouting of the Danube, 19th century Vienna became the capital of the Austrian empire. Bombed in 1944 and 1945, Vienna was later painstakingly reconstructed. Austria gained independence in May 1955 and maintained political neutrality, meaning that it became an important centre for espionage. During the Cold War the city allegedly had more spies than Austrian soldiers, hence the relevance of films such as The Third Man, for which Vienna is still famous. In 2001, Vienna became a UNESCO site, although that is now under threat from planned skyscrapers. Infamous now for still allowing smoking in restaurants, I saw it referred to in one article as the ‘ashtray of Europe’. I think that’s stretching it too far, but it is worth bearing in mind if you are taking the children out to restaurants, as it does make a difference. The colourful St Stephans Cathedral, Vienna. This really is the heart of Vienna and of its old cultural quarter. The Gothic cathedral dominates the area with a colourful roof of green, gold and white tiles. The cathedral was consecrated in 1147, was rebuilt after a great fire in 1258 and had towers added in 1433 and 1450. It was damaged by the French bombardment of 1809 and again by fire in 1945, when sparks from burning houses in the vicinity started a fire in the roof, walls collapsed and caused significant damage. It was reopened in 1952. Restoration works are still ongoing but are discreet and don’t ruin the overall look of this amazing Gothic structure. Entrance to the cathedral is free but you can pay to go further into it and get a tour. It’s worth going in first and deciding if you want to pay more to go in (we decided against it). It’s packed with tourists and is very dark and gloomy with a rather oppressive feeling to it, probably due to the jostling crowds. However, what is rather more enjoyable is a trip up one of the towers. The north tower has a lift and is outside with a 360° view, the South tower has 343 steps and takes you higher up so you can look down on that vibrant roof. 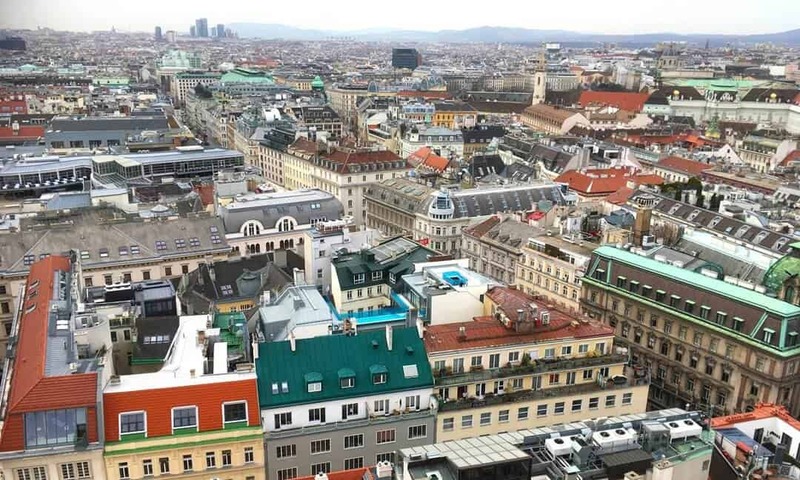 You get wonderful views across the colourful baroque rooftops of Vienna. There is also a shop up there, which seems a little odd, in the historically graffittied room where fire watchers and Turk watchers were stationed in times past. It’s quite a climb but we all agreed it was worth it. Back in the interior of the cathedral is the entrance to the catacombs. You wait at the top of the steps for a guided tour, which is the only way to see them, and pay the tour guide directly at the end. The guides do the tour in German and then provide an English translation. The catacombs are divided into two parts, old and new, with the old parts having been refurbished and which are painted white and brightly lit. These contain the tombs of Vienna’s bishops, some rulers and nobility including that of Rudolf IV who has been there since 1365. Their internal organs were stored in urns which you can gaze at with slightly macabre enthrallment, and their hearts were placed in silver urns in the Herzgruft (Heart Crypt) in Hofburg Palace. The newer parts are gloomy and forbidding. We crept along raw brick corridors, with dim, yellow lighting, to see the ossuary caverns where the bones and skulls of 11,000 people, many of them plague victims, were thrown in. When the caverns got too full, prisoners were sent in to restack the bones and make some space. You can peer through rusted metallic grilles to see the bones piled high and feel a shiver of morbid fascination. These catacombs are ideal for older children as it’s something a bit unusual and have an air of ‘dark tourism’ about them. Mine were fascinated the whole way round, especially looking at the huge piles of haphazardly stacked bones. No photography is allowed in the catacombs out of respect for the dead. The cathedral square is a busy place, but is fully pedestrianized and a lovely place to sit and watch the world go by. Its permanently filled with tourists and ticket touts dressed in flowing red gowns (I’ve seen them referred to as Mozart Stalkers) looking rather incongruous as they shout on mobiles and pursue you to sell tickets to all sorts of concerts and events – don’t pay anything until you’ve looked online to see what it would cost you to buy a ticket directly. They are harmless though and can easily be brushed off. The entrance is in a separate small building at the back of the cathedral. The Catacombs tour lasts 30 minutes. The cathedral is too busy for young children or those in pushchairs, they will just get jostled about and are unlikely to enjoy the experience. The north tower with the lift would be the best one for little legs, to avoid the the 343 steps of the South tower, although apparently it can get very crowded up there. There is no minimum age limit for the catacombs, but I would say they are more suited for children who have reached the age of enjoying the slightly macabre, probably over 8 depending on the child. The cathedral square is full of entertainment such as buskers, jugglers, mime artists and there are plenty of cafes and ice cream shops on offer to keep everyone happy. View from the South Tower over those wonderful Baroque rooftops. I cannot recommend this museum highly enough for children, and it’s a lot of fun for adults too. Do it at the start of your holiday so the children have got some context for what they’ll see as you explore the city. 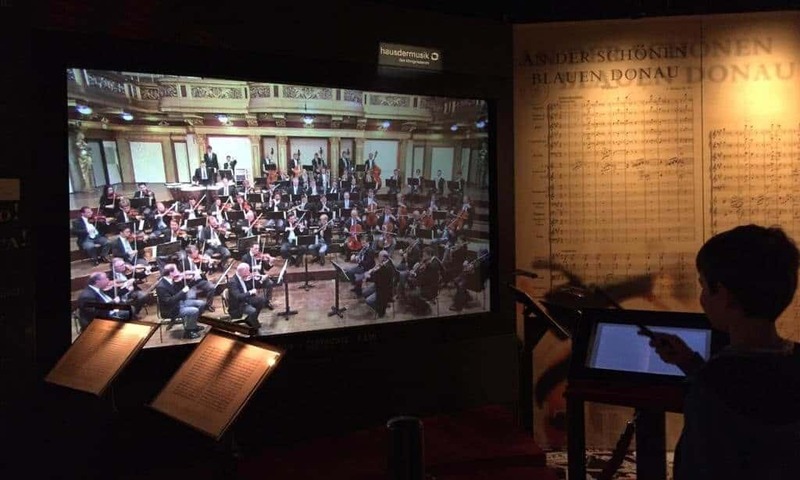 It’s an interactive museum of Vienna’s history and includes talking figures, film, rides, animations and more. The fabulous film races you through the history of Vienna, which is really quite exhilarating and starts with the Roman occupation and ends with Austria’s independence in the 1950s. The museum covers politics, royalty, music, composers, café culture, war and art in a very entertaining yet educational way. There’s also a bunker simulation of the bombs dropping on the city in WWII which I found fascinating, only ever having been in British bunker simulations before. To experience it ‘from the other side’ was both enlightening and disconcerting. It is quite pricey but is worth every euro if you’re taking children. Language specific headsets are used throughout the tour. Book online with GetYourGuide, and you can cancel up to 24 hours in advance for a full refund. Pushchairs are allowed but there are quite a few steps to navigate. 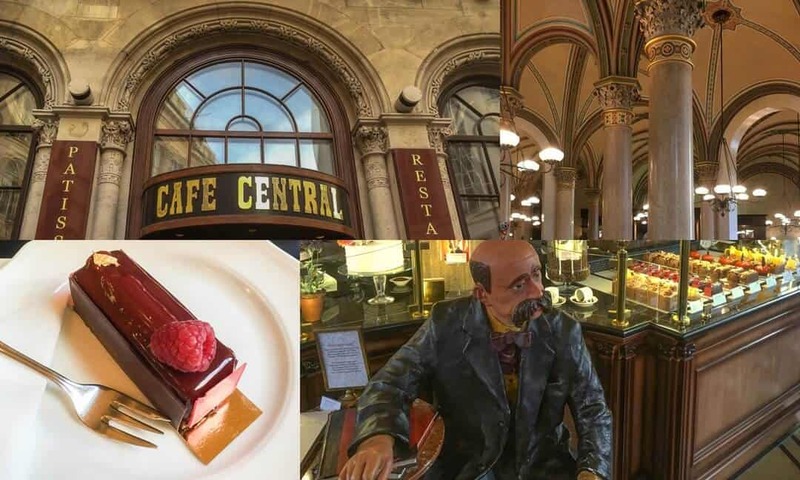 Located in Inner Stadt, the Café Central is a cultural icon and satisfies the visitors need for culture, history, architecture and food all in one. Although there are usually queues snaking out of the door, they move quickly and it is certainly worth the wait. The café originally opened in 1876 and was the central meeting place for 19th century Viennese intellectuals - a place of debate, chess, cigars and coffee. As you enter the café, you see a statue of Peter Altenberg, a well-known bohemian writer who frequented the café so often that he had his post delivered there. Other patrons include Tito, Freud, Stalin, Hitler, Lenin and Trotsky. The interior is truly breathtaking with ornate vaulted ceilings, polished floors and rows of incredible looking, glistening delicate cakes. The loud clatter of crockery over the hubbub of excited tourists, the aroma of coffee and the bustling efficient waiters makes for such a vibrant atmosphere that it feels like a true occasion. Service is quick and efficient, the food was delicious, but it is the ambience that makes it so special. To sit where such eminent people from history have sat before, to appreciate the same sights, sounds and aromas is remarkable. It goes without saying that it’s a good place to take children - there’s cake involved. Even they have heard of Hitler and couldn’t help but look around slightly in awe – it felt more like being a part of history, rather than just observing it. A coffee and cake here make you feel like you are at the heart of Viennese café culture, even if you are surrounded by fellow tourists. The menu covers all meals as well as snacks and changes regularly. The iconic entrance, vaulted ceilings, succulent cakes and statue of Peter Altenberg. The plague column is a huge gilded, frothy monument in the high baroque style, located on the Graben which is the main throughway of central Vienna and leads to the cathedral. Erected in 1693 to replace a smaller wooden column that had been placed there during the plague, it is a monument to the last of the big plague epidemics which so afflicted Vienna, due to its central location and main trading status. The column was erected by Emperor Leopold I who had vowed to erect one if the plague would end, as he fled for safer climes leaving his subjects to suffer. 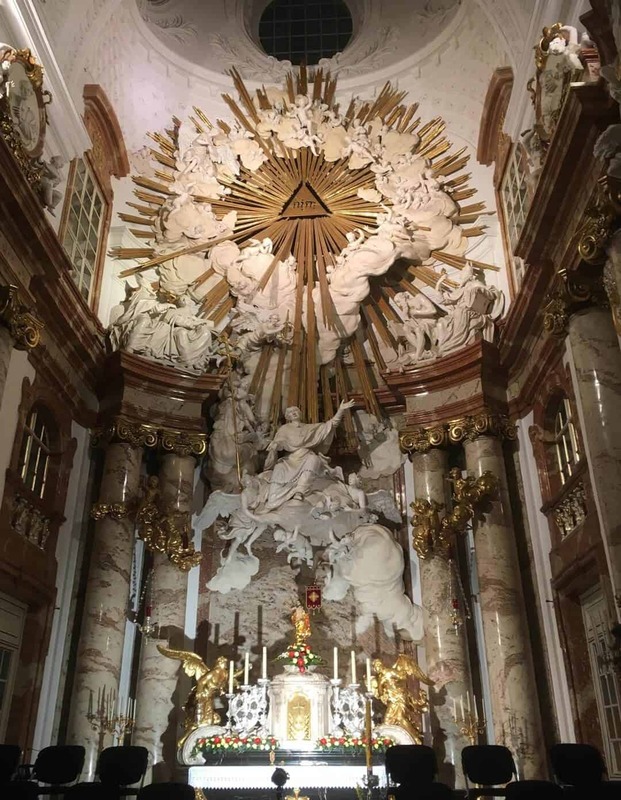 It is covered in religious iconography and Hapsburg motifs and it is worth having a closer look at the details. Its place in the pedestrianised Graben, next to many outdoor cafes all of which sell child friendly milkshakes and mocktails, means you can sit and watch the world go by on this busy street and admire this golden confection at the same time. The Plague Column in all its frothy Rococo glory. The Prater was once imperial hunting grounds until Emperor Josef II donated the area to the Viennese in 1766 for public recreation. He allowed the establishment of restaurants and snack bars which meant it swiftly became a place of leisure and a place to be seen for the Viennese. The only World Exhibition in Vienna took place at the Prater in 1873 where 53,000 exhibitors presented their cultural accomplishments in an area of 2.3 million square meters. In 1895, the amusement area "Venice in Vienna" was established, which included the Riesenrad, which was built in 1897 to celebrate the 50th anniversary of Emperor Franz Josef. This is the iconic ferris wheel, which at 212 feet tall and with its bright red wagons is an icon of Vienna. Although it burnt down in 1944 it was swiftly rebuilt, and back up and running in 1947. Made famous by the film noir, ‘The Third Man’, it sits at the entrance to Prater Park and is a must visit for anyone going to Vienna, giving wonderful views across the city. The rest of the park is fabulous and is an excellent day out for kids. It has free entry, a huge amount of rides which cater to all age groups, and is open 24 hours a day, all year round. Bear in mind that although entry is free for all, you pay for the rides you want to go on. The cost varies from €1.50 to €5, depending on the size. You can buy an advance ticket for the Reisenrad ferris wheel. We had a great day there and I can highly recommend the ‘Hotel Psycho’ ghost train. Being used to the ghost trains of English fairs, we did not expect this, and it is the only time I have bought a photo of us on a ride, as the look of total terror on mine and my daughter's face was a joy. You will need to take lots of euros for a day here, but it is definitely worth it. The distinctive Reisenrad ferris wheel. Don't walk there like we did, as it's a very big park and you will want to save your energy for getting around it. The park is well served by public transport - the main entrance of the Prater is located directly at a huge roundabout, the Praterstern. At the centre of this traffic junction is the location of a railway station with stops for the metrolines U1, U2 and some rapid transit lines (S-Bahn). The terminus of the tram lines O and 5, as well as the bus stops of lines 5b, 80A and 82Aare situated in front of the station building. Go during the day if you're taking kids as its much quieter than at night and with far less queuing. Unless you are staying very close by, allow for a whole day here. You can pick up a free map once you're at the park. There are plenty of places to eat from snack stalls, ice cream kiosks and full sized Biergartens where you can get some excellent meals. You may need to take out a second mortgage to pay for all of the rides and food, but it is a very enjoyable trip for the kids and a good way of getting rid of any 'museum fatigue'. We stumbled across this completely by accident, as we hadn’t seen it advertised anywhere or in any tourist literature. My daughter had insisted on a trip to the Vienna Hard Rock Café (to buy one of their t-shirts for cool points back home) and we saw a very small building near the back door with Wiener Wiesenthal Institut für Holocaust-Studien' written above. I decided to go in here with my Mother, leaving the children with my husband, being unsure if what was inside would be child friendly. There is very tight security to get in, we had to go through a single person door lock chamber and were asked for passports, which we didn’t have, and asked if we were carrying any weapons. We must have looked innocent enough as we were eventually allowed in but were watched the whole time. It’s small and simple but I found it very powerful and moving, and it includes some of his personal effects such as his map covered with Stars of David on it, depicting the concentration and extermination camps. It would have been fine to take children into, although I’m not sure they would have understood or appreciated it much. Opera in Vienna is considered the best in the world, and its home at the Opera House is suitably fitting. Built in the Neo-classical style, the building opened in 1869 with a production of Mozart’s Don Juan. Most of the building including the auditorium was destroyed in American aerial bombardment in 1945, but it was faithfully rebuilt after the war and is now one of the busiest opera houses in the world, producing sixty operas a year as well as ten ballets. It also produces several productions a year specifically for children. The only way to visit, other than watching a performance, is with a guided tour. We joined hordes of people queuing, were divided into our respective languages and given an enjoyable tour round the building. We saw various reception rooms, all of which are exquisitely decorated with statues, huge chandeliers and frescoes. Our guide showed us a video of the annual Vienna ball which takes place here, and then led us into the auditorium. Work was in progress on stage for the set of Parsifal.The seats we were in are 180 euros, those in front 200 euros. However, you can stand for 3 or 4 euros, queuing beforehand, and the 4 euro places behind the stalls were quite impressive – the view of the stage superb. The tour is not really aimed at children so they may not appreciate the splendour of the building the way an opera keen adult would. A good compromise, so that you can still experience Viennese opera without spending any money or boring the children, is that some evenings they relay the action from the stage onto a huge screen in the square outside. On an evening walk, we were delighted to watch the beginning of Act 3 of Ride of the Valkyrie in full and glorious sound and we were able to stay until the children declared it just too boring to cope with any more. From Monday to Sunday there is a 40 minute guided tour in German, English and Spanish. 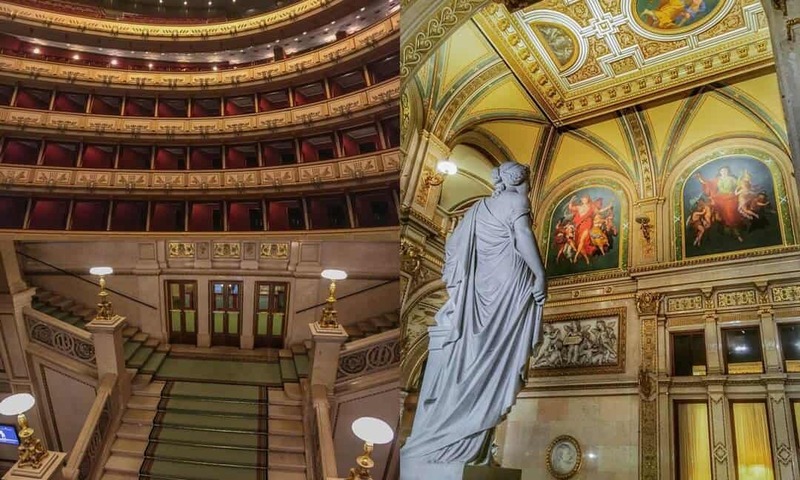 The stunning gilded interiors of the Opera House. A large Byzantine and Gothic building located beyond Belvedere Palace, the HGM is an impressive building with a lavish interior which houses imperial military collections from 16th century onwards. Well laid out and with a lot to see, the downside is that a lot of the exhibits are without any explanations in English, and although you can hire an audio guide or download an app on your phone, reviews say that neither of these give you fully adequate information. The naval hall was particularly interesting, but it was the WWI hall that we had gone for as it has the car that Franz Ferdinand was in when he was shot, the uniform he was wearing and the sofa they laid him on. I also found the WWII hall fascinating as it showed the whole other side of the war and focused on the Eastern Front, which in the UK we are less familiar with. It was very interesting to see the war from the other side and to see how they present it. Its quite a long walk from the centre of Vienna, so do use public transport to save little legs. This museum is not the best of places for children unless they are really into military artefacts, as so much was in German and there were no interactive exhibits. The cafe wasn't ideal for child friendly food either. I would probably keep this as for an adults only trip, or a brief visit on one of their free days if you are in the area anyway. 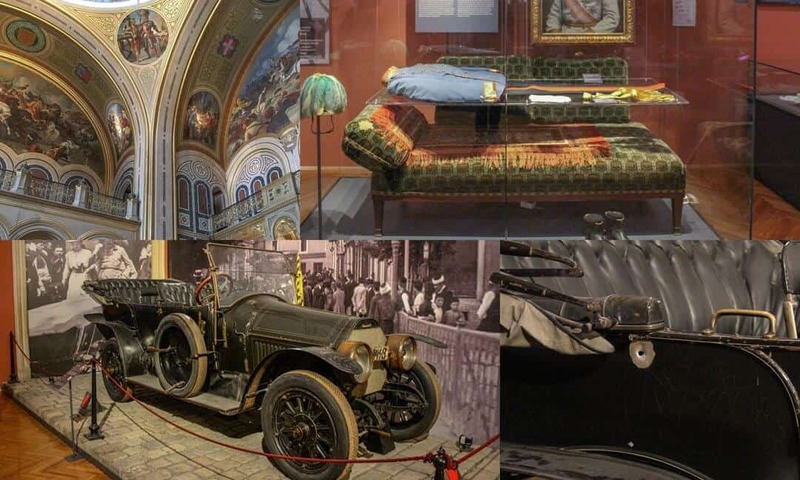 Interior of the HGM, the car and uniform of Franz Ferdinand and the sofa he died on. I had long wanted to enjoy a concert in Vienna and there are many concerts put on mainly for the tourists. As both my Mother and I are fans of Mozart, we opted for a trip on our own to the concert in Karlskirche of his Requiem Mass. The church is stunning, both inside and out and I could not have chosen a better backdrop for a truly memorable concert. I booked the tickets online in advance to ensure that we got good seats in this hugely ornate baroque church. The orchestra was 1756, the choir XVII – and there were indeed 17 of them including the four principal singers. Their bodies and throats were encased in coats and scarves against the chill as they performed the Mozart Requiem Mass for us. There was a fabulous view, a flamboyant and energetic conductor, and stunning music. It was brilliant, and an extra bonus was a performance of Ave Verum Corpus as an encore. The programme varies so look online as they often perform Vivaldi as well – he is buried just next door. Bear in mind that the church can get really cold so wrap up well, and there are no bathroom facilities available on site. Illuminated baroque interior of Karlskirche before the performance. All of the principal buildings, and many minor ones, are lit up at night making Vienna look just as impressive by night as it does by day. A walk through the cathedral square and the nearby roads is well worth it to see Vienna in a different light. 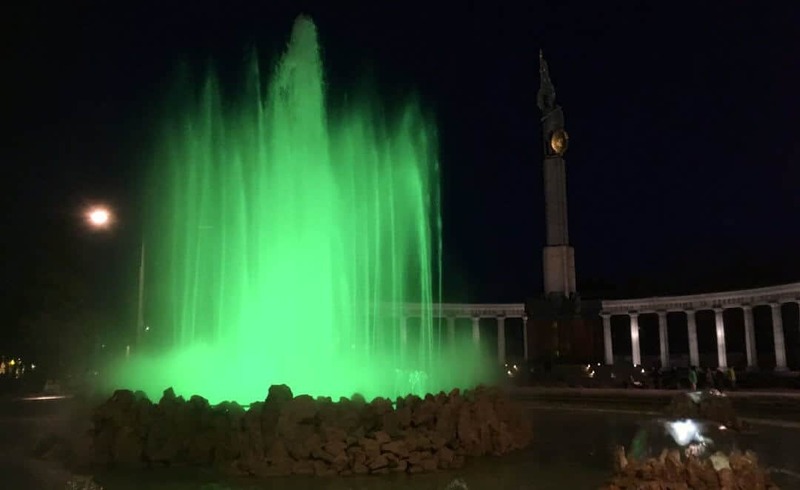 One thing not to miss is the Hochstrahlbrunnen – an illuminated fountain which was built to celebrate the construction of the first water pipeline from the Styrian Alps to Vienna in 1873. It has been illuminated since 1906 (although now with energy saving eco bulbs) and looks amazing in the dark, cycling through all of the colours of the rainbow. Located in front of the Soviet War memorial, it is illuminated between 8pm and midnight in peak seasons. The children really enjoyed watching the changing colours and running around in the huge space around it, trying not to get wet. Illuminated Hochstrahlbrunnenn in front of the Soviet War Memorial. Schönbrunn Palace is the Baroque summer home of the Hapsberg rulers and a major tourist attraction for visitors to Vienna. The site is massive and houses the palace with 1,441 rooms, vast gardens, a zoo, sculptures, an orangerie, ‘Roman’ ruins (constructed in 1778), a children’s museum, the famous Neptune fountains, a Gloriette and best of all for children, some wonderful play parks. These have some innovative equipment to play on that are a lot of fun for all ages. Thousands of tourists seem to descend upon the place but are all absorbed because there is so much space. We decided against the guided tours, of which there are several to choose from, as the sun was shining and it was wonderfully warm, so we explored the mazes and Neptune’s fountain then walked up the hill to the Gloriette for views over the palace and a very acceptable lunch within the magnificent surroundings. There is so much to do there that we didn’t really touch the surface, but there is bound to be something to suit everyone. Have a look at the website before going so you already have an idea of what you want to do as it can be quite overwhelming. Tickets can be purchased online to avoid any queues. The cost of tickets vary according to what you want to see, as there are single and combination tickets. There are different tours you can take that vary in length, location and price. Some of the combination tickets include access to other sites not in the Palace. The play parks, maze, Gloriette and some of the gardens are all ticketed separately. If you're going to take children to any of the palaces, this is the one I would recommend. There's a children's museum which focuses on the life of the Imperial Family from a childs point of view. The Schönbrunn Tiergarten (Zoo) looked like a really good one (we didn't go in ourselves) and is open 365 days of the year. The best bit, from our kids point of view, was the wonderful playparks. There was one which had loads of water features for them to play with, one with some brilliant rides and a giant maze. There is a lot of space to run around in and places to explore - getting right behind the famous Neptune fountain was fun. There are plenty of places to eat and ice cream kiosks, even out of season. Schönbrunn Palace and the Gloriette. 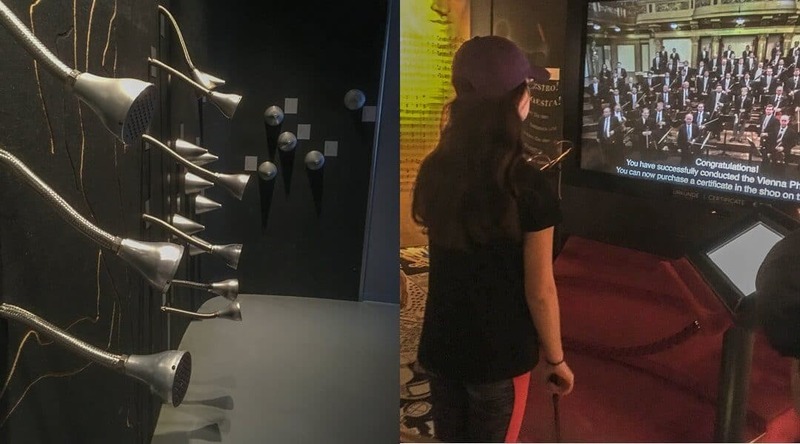 Haus der Musik, in Inner Stadt, is an interactive sound museum, focusing not just on Vienna’s incredible musical history but also on sound itself in some highly enjoyable interactive exhibits. It gives a fantastic and concise summary without the need to visit each of the individual composer’s houses that are in Vienna, making it ideal for children. We had piano stairs, a museum on the Vienna Philharmonic, good displays on the lives of Mozart, Schubert, Haydn, Beethoven, Strauss and Mahler with plenty of appropriate music. There are lots of hands-on displays on how sound works, as well as rooms that focus on particular sounds. The best bit was the chance to conduct the Vienna Philharmonic. On a huge screen Zubin Mehta appeared to show you how to use the baton for the piece of music you had chosen. If you got it wrong, the whole orchestra would sigh, put down their instruments and berate you for your incompetence. It was a lot of fun as well as very instructional about Vienna’s musical past. We all had a most enjoyable time here and I would definitely recommend it for children. Listening to different sounds through earhorns, and conducting the Vienna Philharmonic. A family ticket is €29 for 2 adults and 3 under 12s. I wouldn’t really class this as historical, but it’s a lovely little interactive museum with some really fun illusions and definitely one for children to appreciate. This park was completed in 1872 and includes the famous cast-iron pavilion which had been exhibited at the London World Exhibition of 1851. The park straddles the River Wien and is a beautiful place where the Viennese stroll, rest and play. 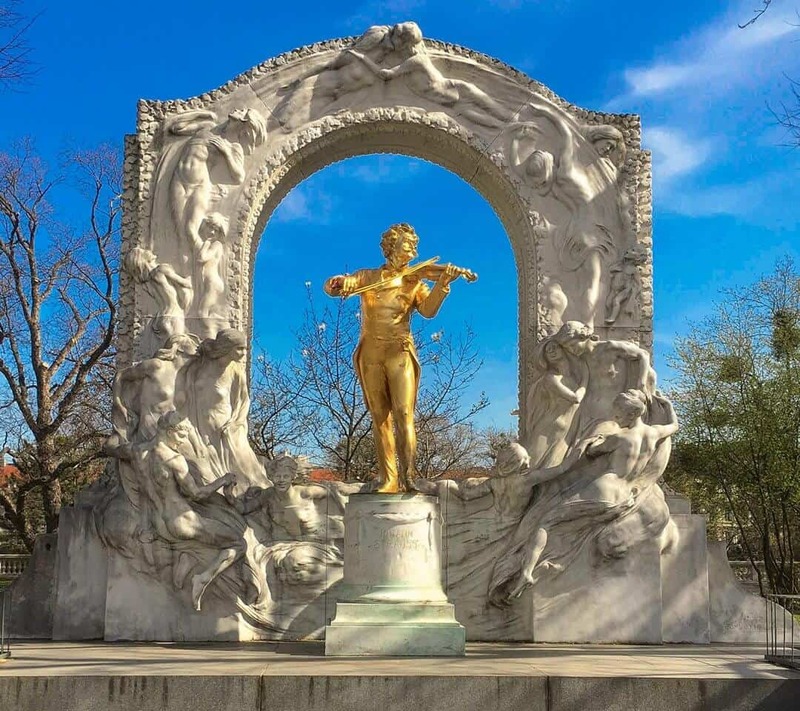 It includes the most photographed monument in Vienna, that of Johann Strauss, a gold plated bronze statue with a marble relief which was unveiled in 1921. The park is immaculately maintained and a wonderful place to spend time on a warm spring afternoon, listening to the buskers and watching the children play. A golden Johann Strauss in Stadt Park. The Apple Strudel Show and Tasting – is in Schönbrunn Palace and is a 20 minute live show on how to prepare this Viennese classic dating from 1696. Melk Abbey – a boat trip on the Danube through what is said to be the spectacular countryside of the Wachau Valley and to the UNESCO World Heritage site of Melk, I was so keen to do this but the logistics of arranging it seemed challenging at that time of year without the direct trips they offer in the summer season. Danube Tower – this was closed when we were there otherwise we definitely would have visited, as I have an inexplicable penchant for revolving restaurants, and I think the kids would have loved it too. A day trip to Bratislava – this is easy to do by train, bus or boat from Vienna, or take a private tour, but we just didn’t have the time with so much on offer in Vienna itself. If you do go, don't forget to take your passport! We did most of our journeys by foot, as Vienna is very easy to walk around with wide pavements and plenty of pedestrianised areas. Trams are also a good option; they are clean, easy to use and run regularly. There are also hop on/hop off buses that will get you around the main sites, and which are included if you decide to buy the Vienna Pass. The Vienna Pass gives you access to a multitude of sites, fast track entry and free use of the hop on and hop off buses. 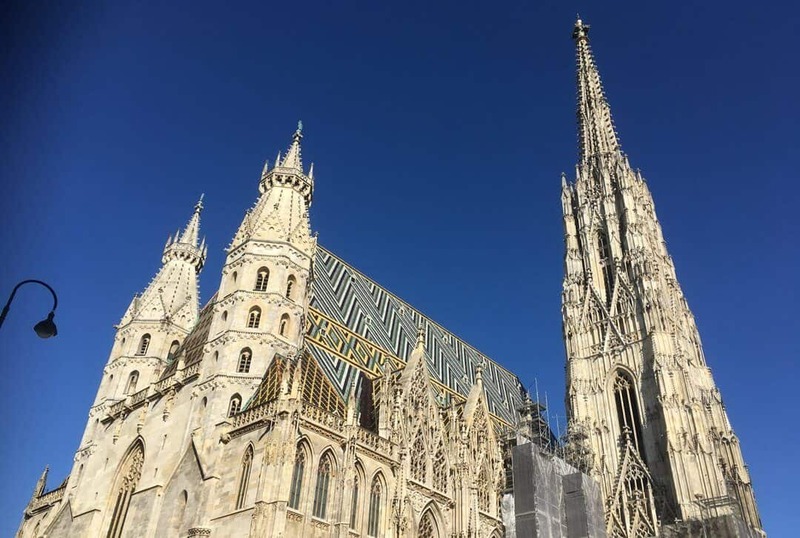 However, we didn’t use the Vienna Pass – after much research we realised that it focuses mainly on more adult places to visit and not that much for children, who have a limited interest in art, palaces, musician’s houses, libraries and wine cellars. 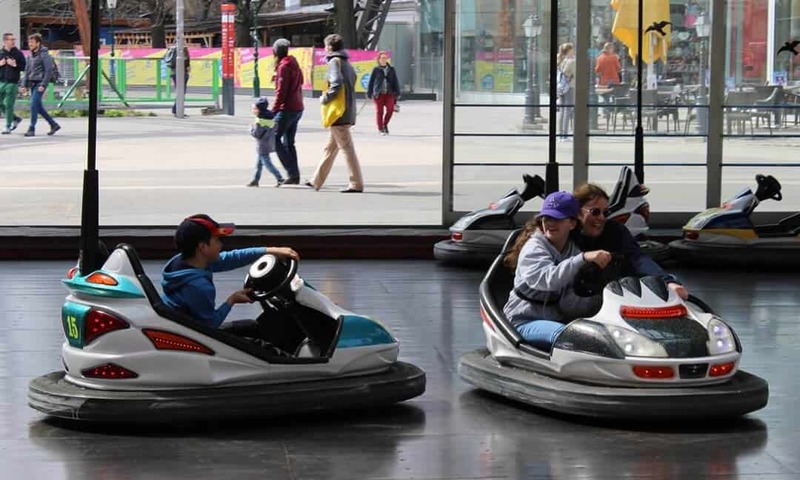 The children’s attractions that it does cover, such as the zoo and Madame Tussaud's, were things that could be done in any country and we were trying to focus on specific Viennese attractions. It did cover the Military Museum, the Prater Ferris wheel, the House of Music and Schönbrunn Palace, all of which we did, but we would have had to pack these into a single day to get close to the financial benefits of the pass. We spread these out over 4 days. With children, you have to be able to adapt to their needs, and if someone doesn’t want to go somewhere on a particular day, not having the pass gives you the freedom to do remain flexible and just spend the afternoon chilling in the park or drinking milkshakes in a café, rather than on a rush around the city just to get your money’s worth. Paying to skip the line can be very beneficial with children, but in April the queues were not as bad as I’m sure they do get, so again that didn’t need to be taken into consideration. That being said, if we had gone on an adult’s trip, I would definitely have got one and charged around the city packing in as much as I possibly could. There are sometime special offers on the passes, so it's worth having a look before you decide. I loved reading this article. The article is written in a relaxed and homely style, and the supporting photographs make it very easy to soak up the atmosphere and feel you are there. There is plenty of information about the history, accessibility, child friendliness, and the delights of visiting each major attraction. It really makes me want to visit Vienna for myself. Cracking article packed with really useful and sensible advice. The photos are great and the comments obviously reflect the honest views and experience of Sarah’s family which make it an invaluable guide for others. I have visited Vienna several times, more recently with children of 7 and 10 years. This blog would have been invaluable before our visit. 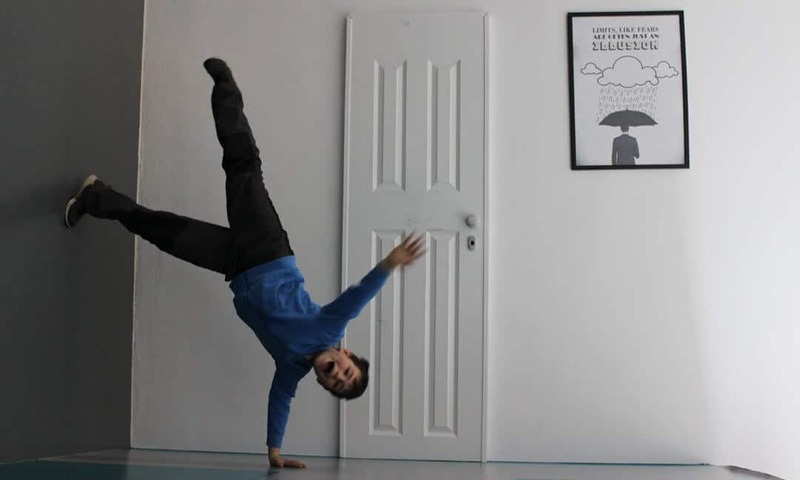 How to make the most of a few days and spend time and money to best effect. Its a great city for families and in the school holidays there are often free or inexpensive activities offered by museums, especially in the Museum Quarter. There’s just so much to do there that we didn’t even make it to the Museum Quarter. Next time I hope!